The ACA amended the Internal Revenue Code (Code) to require large employers, health insurance issuers and self‐funded plan sponsors to report information about health plan coverage to the IRS so that the federal government can enforce the employer mandate. Code § 6055 requires annual information reporting by health insurance issuers, self‐insuring employers, government agencies and other providers of health coverage. Code § 6056 requires annual information reporting by applicable large employers related to the health coverage that the employer offers (or does not offer) to its full‐time employees. Under the ACA, large employers that do not offer their full‐time employees (and dependents) health coverage that is affordable and provides minimum value may be subject to penalties. The ACA's employer mandate provisions are also referred to as the employer shared responsibility or pay or play rules. The IRS issued Notice 2013‐45 to provide more information on the delay. According to the IRS, the delay of the reporting requirements provides additional time for input from employers and other reporting entities in an effort to simplify these requirements, consistent with effective implementation of the ACA. This delay is also intended to provide employers, insurers and other providers of minimum essential coverage time to adapt their health coverage and reporting systems. It is still unclear how the new deadline will impact guidance that has already been issued, such as the transition relief for non‐calendar year plans and the optional safe harbor for determining full‐time status. Future guidance may affect these and other rules under the ACA. The Obama Administration's decision to delay the employer mandate penalties and related reporting requirements will have a significant effect on many employers. 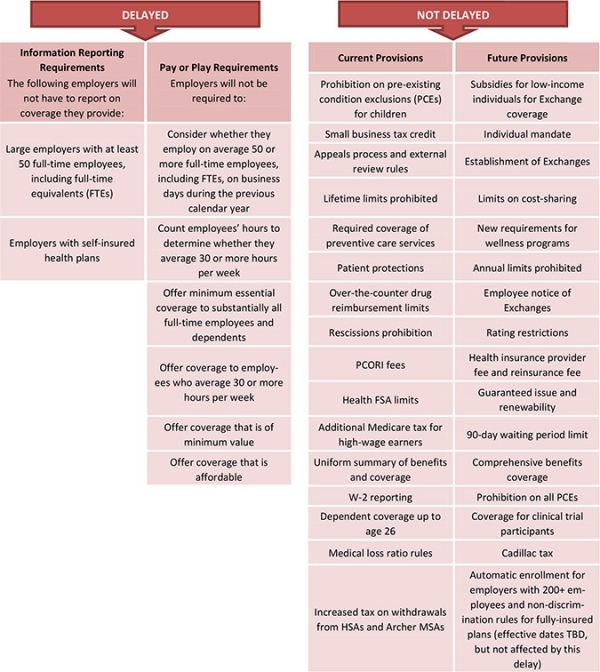 See below for an overview of the ACA provisions that are affected by the delay, the provisions that are not affected by the delay and steps that employers are encouraged to take in 2014.
construed as legal advice. Readers should contact legal counsel for legal advice.